A basic quiltmaking item, this single-faced masking tape has multiple uses. Quilters place it on the sewing machine as a 1/4 In seam allowance guide when piecing quilts. Used to "mark" quilting lines. Can be repositioned without damaging fabric. Use in place of pins to hold hems in place. Makes a very fine, black permanent line. Perfect for making quilt labels and signing friendship quilt blocks. Great for detailing appliqué designs and art quilts. 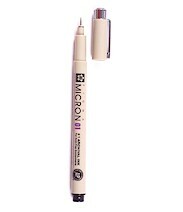 Pen makes a PERMANENT black mark that will not wash out. Test pen on a piece of fabric to satisfactory results. 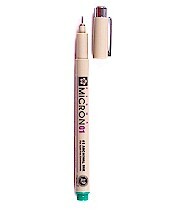 Replace cap when not in use to prevent ink from drying out. 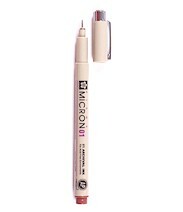 The Pigma Micron is a fine point drawing and illustration pen that provides the archival quality of Pigma ink. • BACK IN MULTIPLE COLORS • Finally! A fine tip, heat transfer pen! 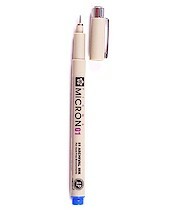 Creates delicate lines for fine embroidery designs. For use with PDF printout patterns, embroidery patterns that no longer imprint, or your own original designs! The ink will transfer to pre-heated fabric with a hot, dry iron. 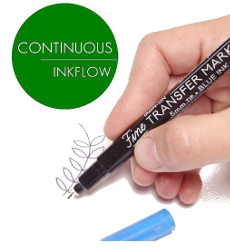 Time to upgrade your transfer pencil!